Persepolis by Marjane Satrapi is a memoir of a woman who was raised in Iran during a chaotic, violent time in Iran’s history. Satrapi talks extensively about the Islamic revolution and how it affected her childhood and eventually her view on life. 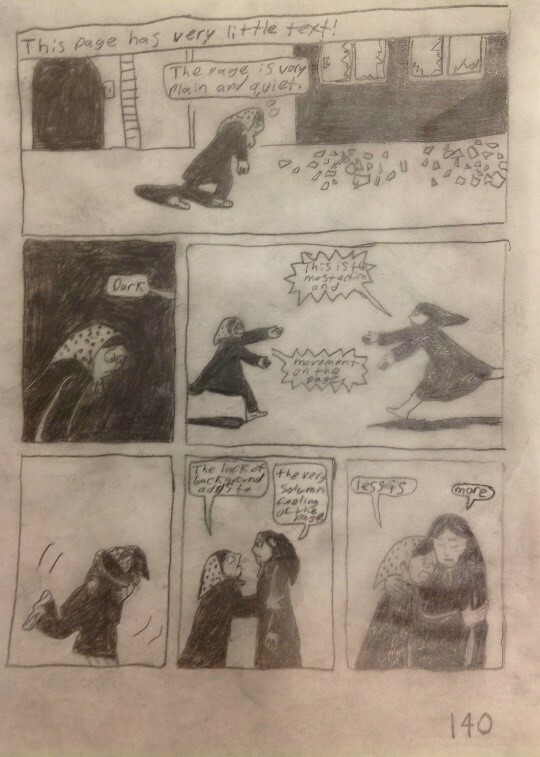 Each of the two pictures above is a page from the book Persepolis that I traced. After tracing the pages, I added in my own commentary in the place of the book’s original narrative. I will analyze these two pages by talking about different themes divided into pages on this website. Thematically I will discuss the narrative, the shading, and what I am calling the noise. After reading Sam Balogh’s Tracing Persepolis, I realized that the image size is also an important theme. I will not discuss the image size here, but Sam does on his site. You can find Sam’s Tracing Persepolis by clicking here. 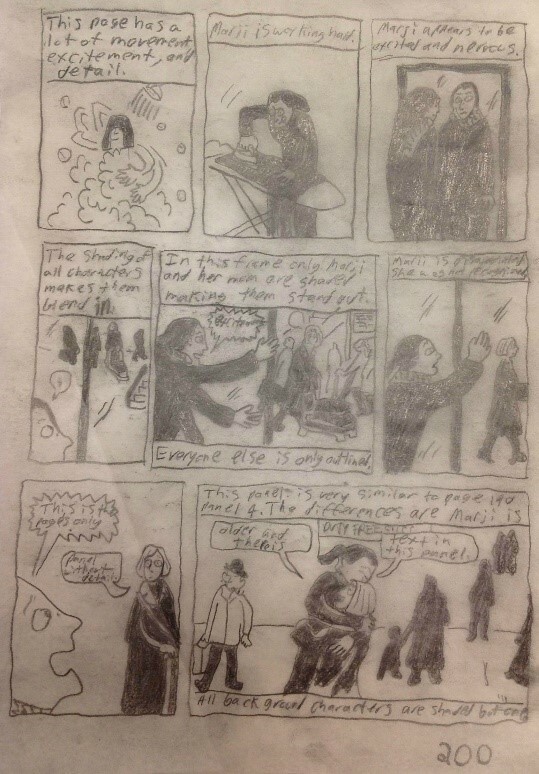 I traced pages 140 and 200, because they show similar events – the meeting of mother and daughter – at different times and in different ways. Page 140 depicts a very traumatic event in Marjane’s life. Marjane is returning home when she learns that a missile has hit one of the houses on her street. The tone is set in the first frame, showing Marjane’s stooping posture, her being followed by a dark shadow, and her approach to shattered glass. In the second frame, she is completely engulfed by darkness, symbolizing negative emotions like fear and sadness. There is little energy or action until Marjane sees her mother. Marjane is then comforted by her mother, showing the main character’s childlike innocence. Both characters display expressions and body language of sadness and defeat. Both characters are frowning, with heads lowered. Page 200 shows a very happy moment in Marjane’s life. The first frame is full of energy, shown by the implied movements of Marjane’s arms. She is also smiling. This shows how excited Marjane is about her mother’s coming to visit in Austria. The next frame, displaying an iron, is significant. Earlier, an iron had been used as a device for torture, but here it is being used as a common, everyday domestic tool. In the fifth frame, where Marjane meets her mom at the airport, Marjane and her mother are the only characters with facial features. 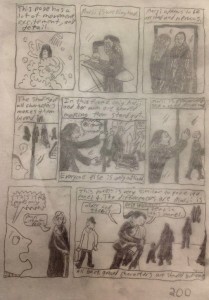 They are surrounded by faceless entities, revealing that to Marjane, the others are not important. The last frame on the page shows that Marjane is now taller than her mother, and the older woman now has white hair. This shows the passage of time, and when compared to the frames on page 140, the theme of past versus present is depicted. The past was darker, more somber, and sadder, while the present shows more energy, more excitement, and more happiness. To continue reading about Persepolis, visit the pages devoted to narrative, shading, or noise. Satrapi, Marjane The Complete Persepolis. Paris: L’Association, 2003. Print. Balogh, Sam. “Tracing Persepolis.” English 101. 27 Feb. 2015. Web. 15 Mar. 2015. <http://eng101s15.hellofrombalogh.net/tracing-persepolis/>.